LANDSAVER, Inc., a division of ACF Environmental, Inc. is a factory certified installer for all products distributed by ACF This service is offered on a sub-contractor basis and is priced per project. Our staff is extremely capable of providing a professional, high quality installation on any product, any size and on time. Geomembranes: HDPE, VLDPE, XR-5, Hypalon and Claymax all require specialized seaming equipment and factory certified operators to install and perform the quality control testing normally required. Our crews are factory trained and each crew has its own specialized equipment. 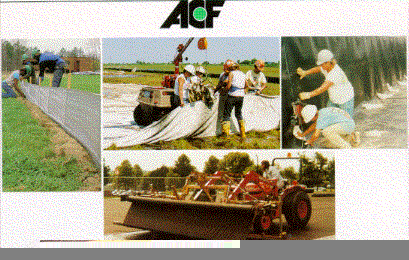 Asphalt Paving Fabric: Landsaver, Inc. has installed millions of yards of paving fabric for satisfied customers. We're capable of performing a turn-key job of spreading the tack coat and laying the fabric ahead of your crew, or just laying the fabric. With our own tack trucks and specialized lay down equipment, we are capable of doing the job correctly the first time and on time. Multiple crews provide flexibility to meet your scheduling requirements. We take pride in not slowing down your paving operation. Silt Fence: Our crews have available several types of trenchers required and are capable of quickly and efficiently installing the proper silt fence material to meet your requirements according to local regulations. Modular Block Retaining Walls: Solid modular block walls have taken the retaining wall industry by storm. Landsaver has installed thousands of square feet of reinforced walls to retain parking lots, landscaping, and building sites to be developed. These walls are less expensive than conventional methods, are long lasting and have the appearance of a decorative wall. Give us a call for specific project quotations. Erosion Control Products: Landsaver, Inc. has installed thousands of square yards of polyjute, jute, excelsior, straw, and permanent mats like Landlok 450 and Bonterra SFB products. We can supply and install mats to meet your job specifications. Soil Stabilization: Proper stabilization requires proper design, use of appropriate materials and correct installation. Landsaver, Inc. is capable of sewing and installing soil stabilization fabrics and Geogrids underthe most demanding conditions. Our crews have field-sewn projects in marsh and tidal conditions. We have the engineering know-how, experienced crews and proper equipment to expertly install your fabric or grid in any type of soft soil conditions. Landsaver is properly licensed and committed to doing the work correctly and efficiently the first time. And we're dedicated to doing your job when you want it done. Give us a call at 1-800-448-3636 for specific job quotations.